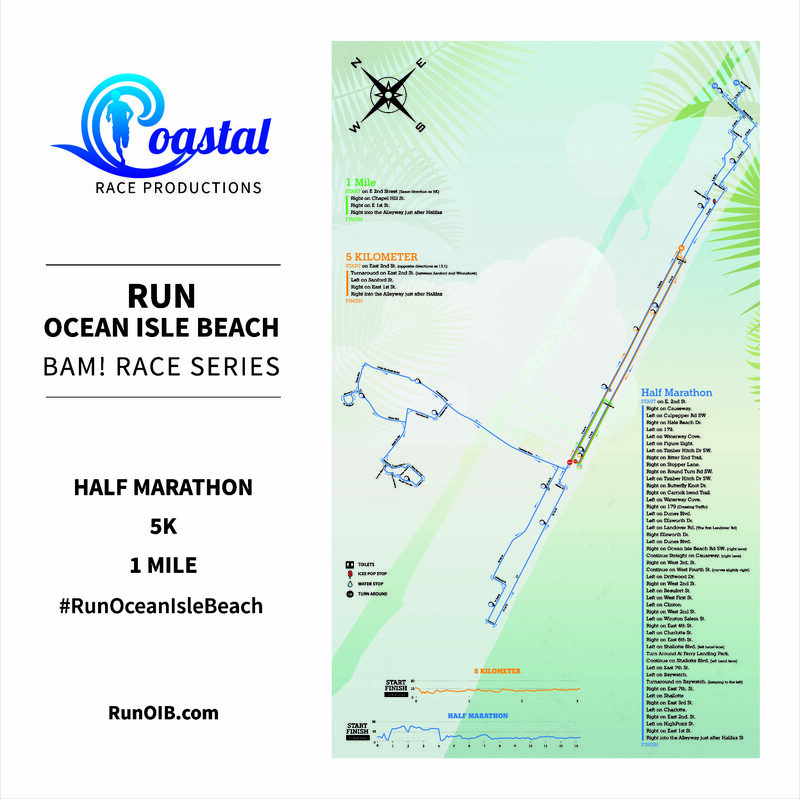 Are you ready for a super detailed instruction of our course route for the Run Ocean Isle Beach race 2018? This is an all new certified course so if you’ve run with us in the past – it’s VERY different – but even better! We have about 100 volunteers, 7 officers and sheriffs, hundreds of arrows (taped on the road and yard signs) – this course is VERY well marked. We have an expert pacing team and bikers to lead you through. Want a printable/zoomable PDF to download, click here. Want a turn-by-turn? It’s on the maps above. Starting out on the island (8 E. 2nd St. Ocean Isle Beach, NC 28469) runners head over the bridge and off the island immediately. Runners will cross into the Southbound lane that is coned just for runners and turn left on Culpepper Rd. (Mile 1). After a quick right turn onto Hale Beach, runners turn left into a coned lane on Beach Dr. (Hwy 179). Here is where runners head into a cute little community called The Cottages. Staying to the left, we have the first waterstop setup and runners take a loop around the community before taking a right back onto Beach Dr. (179) – heading back the way they came. There will be a row of cones splitting one lane here – keep in mind the cross runner traffic runners should run to the left of those cones splitting your lane. Runners turn left out of this coned lane into a community called The Retreat, another really nice area to run through and the second waterstop is not far into the community. Runners take a left at the traffic circle to a quick loop and come back to this traffic circle and stay left to head out of the community. Runners will absolutely love running through The Cottages & The Retreat! 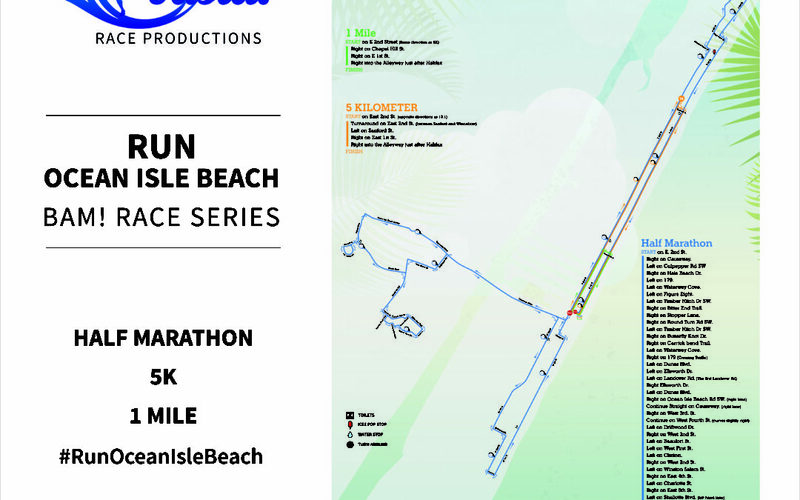 As runners exit The Retreat, they’ll take a right into a coned lane on Ocean Isle Beach Rd. Runners should approach the traffic circle with Sheriffs and volunteers and stay to the right on the outside of the traffic circle to get back into the coned runner lane heading back over the bridge. A look to the left is probably the most AMAZING sunrise over the water and the island – it’s picture perfect! Coming back onto the island runners take a right onto 3rd St. Here runners will want to get moved over to the left (running against traffic) where we have a third waterstop setup. Run all the way down 3rd St. until it stops. A quick left onto Driftwood, right onto 2nd and left onto Beaufort there is a Restroom on your right not too far after mile 6. Turning off of Beaufort (by the watertower) onto 1st St. and the forth waterstop, runners have a coned lane all the way until turning left onto Clinton St. A quick right onto 2nd St and runners cross over causeway and into a coned lane right where they started (but this is only mile 7.5). A look to the right to see the finish line but runners keep running straight to tackle the East end of the island. The fifth waterstop is not far ahead and runners continue straight all the way to Winston-Salem St. then a quick right to a winding 4th St. Runners take a quick left on Charlotte and right on 6th St. to the 6th waterstop. As runners take a left onto Ferry Landing, we have another restroom and a picturesque spot at the mile 10 turn-around (runners should always stay to the left around any turn-around). A short jog down 7th Street to Baywatch Dr. and a turnaround and runners will want to stay to the left throughout this section. Runners take a left onto Shallotte, right on 3rd, left on Charlotte, right on 2nd, left on High Point, right onto first street – sound like a lot of turns but it’s quick and simple. More amazing views of the beach right here! Now runners can partake in an icee pop and they know they’re nearing the end! A seventh and final waterstop and a straight-shot will take runners in a coned lane all the way to a right turn into the finish line – 13.1 Miles! Let me over complicate a 5K with 3 turns and pretty much zero elevation change. Runners start on E. 2nd and head East (opposite of the half marathon and not toward the bridge). There is a very short turn-around and runners take a quick left on Sanford St. A very quick right onto 1st St and runners have a waterstop immediately. Runners take this all the way to a right turn into the finish line. – 3.1 Miles! *Both 1st St. & 2nd St. are completely coned and closed to runners only – a completely closed course. Runners start on E. 2nd and head East (opposite of the half marathon and not toward the bridge). A right turn on Chapel Hill St. and a very quick right onto 1st St. Runners take this all the way to a right turn into the finish line. – 1 Mile!